Tying a tie may be an easy task for some people but there are many who don’t know how to knot a tie. For them it becomes a quite difficult task. If you are a working professional and you don’t know tying the tie then searching your friend daily for this task becomes very hard and sometimes embarrassing too. To get you a solution developers have develop an app on Android platform which will teach you how to tie the tie of different forms for different occasions. The app is really simple to understand and on the top it is absolutely free on Android market. 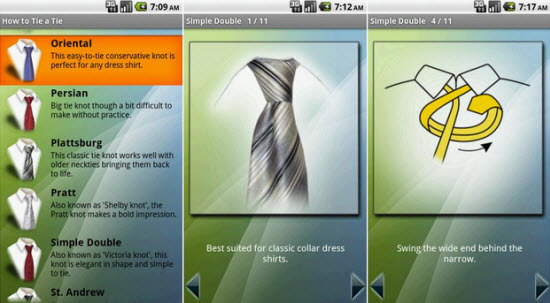 How to tie a tie is a simple learning app which explains the method and step by step procedure of tying the tie. This app offers you 12 different methods of tying a necktie, like for example the Windsor knot, Four-in-hand and Diagonal. The new application How To Tie a Tie will help you learn easily to tie one of the 12 tie knots just in a couple of minutes that too without taking any help from others. You just need to follow the simple instructions given along with the pictures and you will be able to tie a pretty tie knot on your own. The interface of the app is really simple and easy to use. On opening the app you will be asked which type of knot you like to have on your necktie. You can select from the twelve types of knots given to fit for the occasion and after that step by step procedure is explained with pictures to enable to fulfill the task. On the whole it can be a great utility app for those who don’t have any knowledge about tying a tie and it lets you learn the procedure in little steps along with fun. A proovcvatie insight! Just what we need!